Thanks to the law school’s ramped-up career services programs, USC Law’s Class of 2012 graduates are finding jobs faster than their peers around the country. 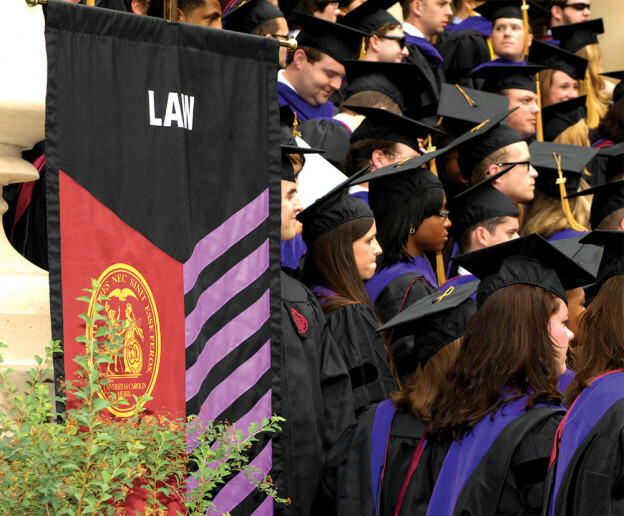 In a time when job prospects are foremost on the minds of law students, the University of South Carolina School of Law’s 2012 graduates have beaten the national employment average by double digits. Put another way, when positions provided by law schools for their own students are excluded, USC Law had the 26th-highest percentage in the nation of graduates employed in the most important category of employment. The positive numbers are borne out under other models, according to “Law Jobs: By the Numbers,” an interactive web-based tool, and an initiative of the Institute for the Advancement of the American Legal System at the University of Denver (available at ). “Law Jobs: By the Numbers” allows prospective applicants to calculate and compare employment rates for every law school using formulas commonly applied by organizations such as U.S. News & World Report, Law School Transparency (LST), National Jurist, and the National Association for Law Placement (NALP). Additionally, users can create their own formulas, based on their own priorities. While Kunkle works with law firms, government agencies, and corporations, Visser visits and works with federal and state judges to ascertain their specific hiring criteria and timetables. By doing so, she can help students and recent graduates identify and attain state and federal clerkships. Small Firm Day, allowing students to meet with lawyers and learn what it’s like to practice at a firm with fewer than 10 attorneys. Other programs focus on how students can get their foot in the door, from workshops on writing cover letters and building their resumes to tips on using social media to find jobs and make connections. *2012 Employment data derived by taking the total number of graduates employed in full-time, long-term positions requiring a J.D., subtracting all positions funded by their own law school, and dividing by the total number of graduates. Employment data came from the ABA’s employment summary page: http://employmentsummary.abaquestionnaire.org. Formula derived from Dan Filler’s Faculty Lounge blog post. ** NALP takes into account all job types, including those falling into “Other Professional” and “Non-Professional” categories, as well as part-time and short-term positions. The other three have a narrower focus, looking at full-time, long-term jobs where bar passage is required or a J.D. is an advantage.